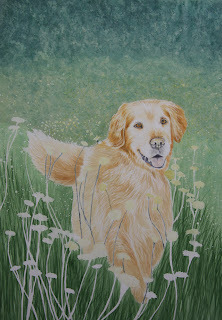 I figured I better put down my brushes and post an update - sometimes it is hard to pull myself away from the easel. I am working mainly on the structure of the fur right now and as the depth and shape progresses so will the richness of the color. Brandi's ears have many more layers than the rest of the fur and you can see the golden red color which most of the rest of the fur will have once the layers are built up more. I have just roughed in some of the dandelions to remind me where the shapes are so I don't over paint them unintentionally. I am fortunate to have a large chunk of studio time today and tomorrow so I hope to have her fur looking shaggy and full soon!